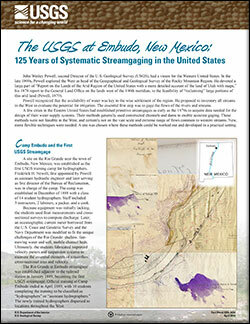 Gunn, Mark A.; Matherne, Anne Marie; Mason, Robert R.
The USGS at Embudo, New Mexico: 125 years of systematic streamgaging in the United States; 2014; FS; 2014-3034; Gunn, Mark A.; Matherne, Anne Marie; Mason, Robert R., Jr. The New Mexico Water Science center has proactively installed three rain gages at two existing streamgages and one reservoir gage within and surrounding the Ute Park Fire burn area. The data will provide local, state, and federal entities as well as area residents with near real time information of precipitation in the area.